Welcome to the Kilkenny Hibernian Hotel located right in the city centre of the beautiful medieval city of Kilkenny, also known as the Marble City. 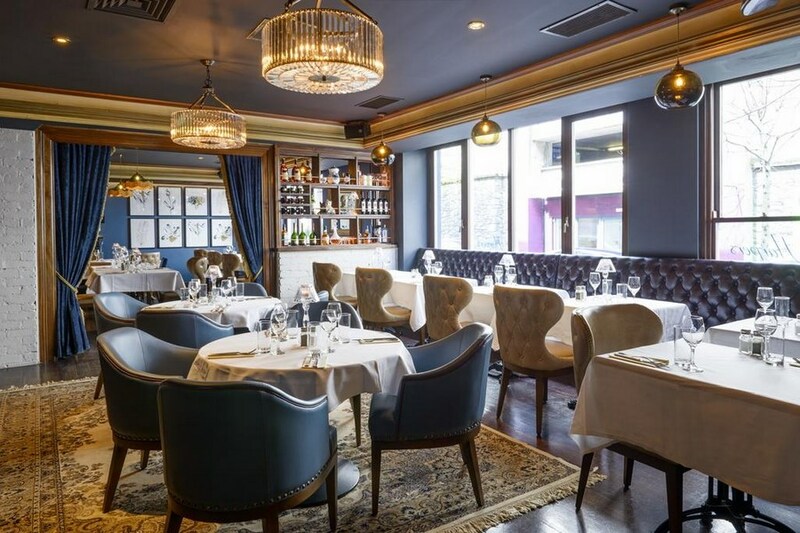 Our award winning 4-star boutique hotel offers luxury accommodation, conference facilities, the popular Hibernian Bar, the City Bar & Grill Restaurant and the underground Morrissons Late Bar where on the weekends you can dance the night away. 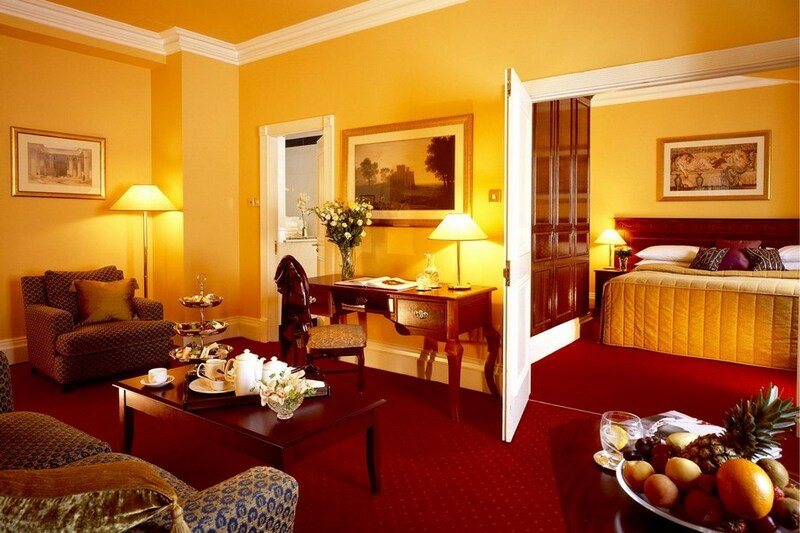 Kilkenny Hibernian Hotel is located right in the centre of Kilkenny City. Kilkenny is well serviced by National road, train and bus routes. The impressive Victorian building was erected in the mid-19th century when it served as a home to the Hackett family. Members of this family include Dr Hackett, a friend and supporter of Charles Stuart Parnell during the 1880s Land Wars, acclaimed biographer, Francis Hackett (1883-1962) and his sister, the novelist Frances Hackett (1884-1963). Excellent Food. Friendly and helpful staff. Prime location. Great hotel location , rooms were excellent, clean , and fresh and well decorated. Food was excellent, overall I would return to this Hotel again . This is a good hotel in a really good location. The room we had was spacious and extremely well furnished with a good bed, a good-sized bathroom, big flat-screen tv etc. The staff were very friendly and the food in the restaurant was excellent and very good value. The down-side is that the foyer is small (as might be expected for a 19th century hotel) and not particularly plush. The bar is excellent and there was a real buzz there on Friday night. The only real criticism is the noise. The nightclub was going strong until 2am and even after that there was a lot of noise form the street. Unfortunately, our room over looked the street. I's suggest that you request a room on the top floors in a quieter location if you want a good night's sleep. We were booked in for 3 nights, and thoroughly enjoyed our stay at the Hibernian. Sadly, the kitchen was closed for the first couple of days due to refurbishment work. We had a continental style breakfast in the Hibernian, and we had to eat our main meal in the Ormonde Hotel, next door. The food in the Ormonde was nice, but the meal we had in the Hibernian on our final night was of a higher standard and style. Locals I spoke to, all spoke highly of the meals provided in the hotel, and said that it would get a lot of "local" trade for special occasions.. Our room was well appointed and spotlessly clean. The bar was nice, and all staff, regardless of their posts, were friendly, efficient and helpful. We would certainly return, and I would have no problems in recommending this hotel. Two small points for improvement, possibly. A few more channels on the television, and if providing a continental breakfast, more than one cheese as an option. All in all, a great few days away. We would highly recommend this hotel. Will be visitng / planning to stay at this hotel again. Great Location, Great spot for shopping, socialising and tourist attractions. We stayed for one night while the couple we were with stayed two nights. Upon arrival Cristina & Laura were very helpful and polite while checking us in. We upgraded our rooms, Yvonne took care of this rooms for us all and we are very grateful. Our room was amazing very comfy and all facilities in the room were a nice touch. Rooms were a little too warm but this was not the hotels fault as it was the good weather we were having. Front bar was nice for a chilled out drink, Harpers Restuarant was excellent, food & service was outstanding both for dinner & breakfast. Our male (tall)waiter for dinner was very nice and friendly and our female waiter the following morning was lovely too. Dinner was amazing and all of us were well impressed, would recommend the chicken wings & burger and we all received a free glass of processco as it was my sisters birthday. Breakfast had a good selection of cereals, fruit mix, youghurts, crossaints, bread & toast, tea/coffee and a nice fry up not too little not too much just right! The only complaint we would have would be about the bouncers on the door in Morrissions Late/Bar club downstairs which is part of the hotel. While we were going in passing the bouncers we felt as if we were been checked if we were too drunk / something else. Trust me we were not drunk / anything else as we had soakage from the dinner we had and only left to go to the club after 11.30/12. We all felt the bouners were rude, on a bit of a power trip and not very welcoming. Turned us off the bar and would probably not socialise there again. Thanks to the all the hotel staff. hi stayed last sunday bank holiday weekend-night away from the baby! lovely hotel, bed very comfortable. Few things that really helped-hotel rang up few days beforehand telling us that parking in multi storey park opposite was free overnight. receptionist next morning charged my phone & was very friendly, small things that make all the difference. would definitely stay again. Hotel and staff excellent, enjoyed our visit, will visit again shortly. My husband and I had a wonderful night in the Hibernian hotel Kilkenny. It is very centrally located and looks like it has been recently refurbished. The food was top class and the staff were lovely.We are already planning our next night there. Dreadful. Needs major refurbishment. breakfast very good and staff very pleasant and helpful. Great location, situated right in the middle of Kilkenny city. Good food and friendly staff. The decor, however, is dated and rooms are a bit tight on space. Impressive beautiful building on the outside, in a great location easy walking distance to everything Kilkeeny has to offer. Parking problem, taken care off by the multistory parking opposite, offered a multi-day discount parking ticket by reception staff on check-in. Parking for 2 days €10 :-D. From arriving at the Hibernian till we left all members of staff were friendly, pleasant, professional, helpful, nothing was too much trouble. Our room was spotlessly clean with lots of space. The bed was huge and very very comfortable. We drank in the bar, lovely old traditional bar with great service. Ate lovely tasty, well presented food in the restaurant. Can't think of a single negative.......great hotel, real value for money, will definitely be back to enjoy another stay. Excellent location with good service, helpful staff and restaurant food was excellent. The room was spacious as well as the bathroom. Very nice hotel, extremely comfortable, friendly staff and the food was also very good. It was a bit noisy as there was a couple of hen nights staying there, but other than that we really enjoyed our stay. Will definitely return as the hotel is very central to everything. Stayed midweek in the Hibernian Hotel. Lovely room with King size bed. Very friendly and helpful staff. Breakfast cooked to order in the morning . Very nice. We were extremely impressed with the hotel and would definitely stay there again. The reception staff were so friendly and accommodating and the food was top class with a very friendly waiter. The room was very comfortable - in fact the most comfortable hotel room I've ever stayed in - it was nice and airy. Review from Northern Ireland. Thoroughly enjoyed our stay in the Hibernian Hotel, Kilkenny. Great location in city centre, within walking distance to all attractions, shops, bars and restaurants. Our room was spacious and quiet. The food is well presented and delicious. The bar is a great place to unwind and enjoy the craic. The friendliness of the staff, reception, waiters/waitresses, maids and especially the bar staff is what makes the Hibernian a great place to stay. Will definitely return. I thoroughly enjoyed my stay at the Hibernian Hotel. The staff were excellant and very attentive. The hotel has a great feel and charm about it and the room we stayed in was very grand. The food is really good I would definitely recommend it to anyone. I will definitely return to the hotel and indeed Kilkenny. Amazing hotel!! Will most definitely be back. Situated in the centre of the city Right beside bars and the castle Room wqs fab, jacuzzi bath included Staff super nice and helpful Dinner and Breakfast were delicious! Couldnt recommend this Hotel more! 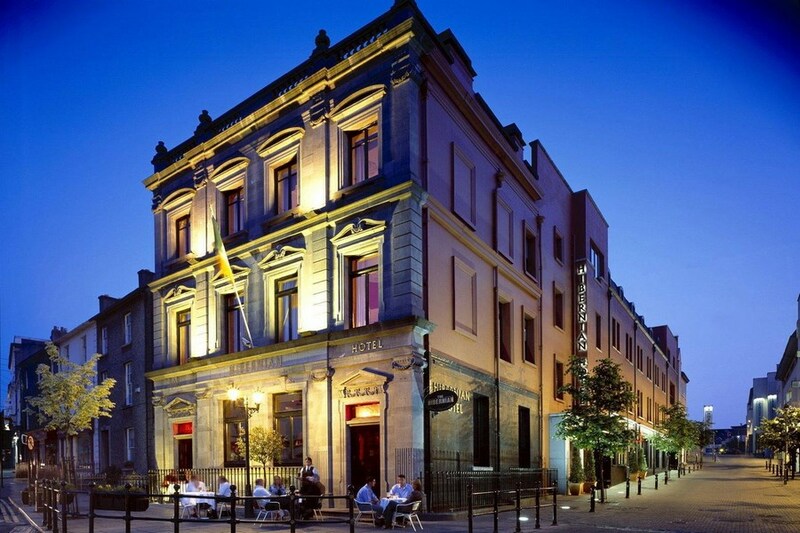 The Hibernian Hotel is a lovely old style hotel in a very central location. We were initially given a room on the livelier side of the hotel and were advised that it would be noisy. However when I pointed out that we had requested a quiet room, we were immediately upgraded to a de-luxe room at the front of the hotel which was a quieter. The room was lovely and was a nice gesture. Excellent central location with late bar situated under hotel so would suit night owls and not those who like to turn in early. Room was lovely, very small TV but who needs it you're in Kilkenny a beautiful city. Dinner was really nice although you might want to add on to the limited dinner deal menu. Overall an excellent hotel and for a little extra breakfast in bed will finish off a love stay. Thank you for giving me the opportunity to write a short review. This offer represented very good value for money. We were very pleased with our stay. The staff were excellent - extremely helpful and efficient and they certainly exceeded our expectations. The food was very good and reasonably priced. The hotel was very busy on the saturday night (three hen parties were taking place) however, this did not intrude on our enjoyment of the weekend. I filled out the comment card on my departure and suggested that bottles of water in the bedroom would have been greatly appreciated and also they might include a shower cap with toiletories in the bathroom. I would certainly stay there again and will recommend it to friends/colleagues. I woule give it a four star rating. Amazing location! We requested a quiet room and the hotel kindly put us up on one of the top floors. Even there we could still hear the disco, although it wasn't very noisy in our room. The staff were lovely and really accomodating. Instead of having a kettle you ordered tea or coffee at any time, so that was lovely. The location makes up for any small imperfections, but overall it was great. We stayed a this Hotel for one night. The hotel was warm clean and very inviting. The location of the hotel is perfect for those who want to be central. The only draw back would be the tea/coffee facilities. All in all it was a great stay, room 125 was perfectly spacious for a hotel room. I would recommend the hotel and we would stay again when we visit. Kilkenny is a brilliant town with friendly people. Just spent one night in the hotel. Excellent Hotel. Very central in the heart of the City. Staff friendly and helpful. Great atmosphere in bar. Car Park was perfect across the street. Would definitely stay again. Lovely old world feel to this hotel.. Staff very helpful. Great location to shops pubs & Kilkenny Castle (do go see it when you are there). Got great deal even though we had to pay for parking. Bathroom a bit small but you can't change an old building. Food also good. No complaints.